Missing teeth are a common issue for many Baltimore residents. Most people who are health conscious don’t often suffer from multiple missing teeth, but losing a tooth is a simple problem that can afflict anyone. Trauma can often knock teeth out, disease can cause degradation, and infections can push out teeth at any time. Oral health is important for a lot of people, but sometimes bad things happen. The oral and maxillofacial surgeons at Maryland Center for Oral Surgery and Dental Implants have ways to treat these tooth loss issues with advanced technology and the expertise of board certified surgeons. For replacing single teeth, the two most common treatment options are the traditional tooth supported bridge and an implant-supported crown. 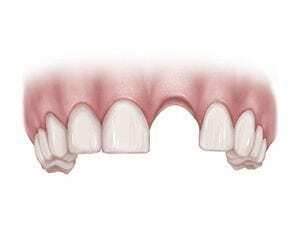 For replacing single teeth, the most common procedure for placing a dental bridge begins with wearing down the two adjacent teeth to miniature wedge shapes. Then the dental implant is placed over the wedge, using the wedge-shaped tooth to hold the implant in place. 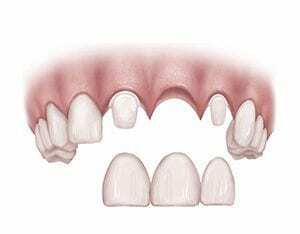 This method of replacing single teeth can be very aesthetic and functional for a period of time. However, a tooth-supported bridge does not replace the bone that previously surrounded the root. Since there is no longer a root to hold the bone in place, the bone deteriorates or melts away. Adjacent teeth must be cut down to support a bridge. An implant-supported crown replaces the tooth root and preserves bone. The surgeons at Maryland Center for Oral Surgery and Dental Implants know that the patients of Baltimore deserve the best treatment with the most effective methods. 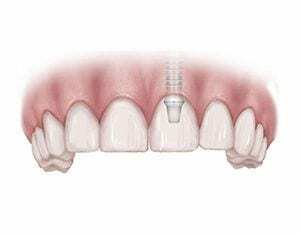 In the pursuit of this, the recommended method of replacing single teeth is using an implant supported crown. Dental implants are a more effective way of replacing single teeth, and even replacing multiple teeth. A missing tooth can cause degradation of the gums and bone, but the implant is placed into the bone structure to replicate a tooth root. This, in turn, encourages the strengthening of the bone and prevents bone loss by providing structure to the jaw and allowing for a strong support structure for the dental crown. For more information on replacing single teeth, contact any of the offices in the Baltimore area for Maryland Center for Oral Surgery and Dental Implants. Call (410) 628-1839 to schedule a consultation today.